This is such a tense and very powerful story following the life of a young German soldier returning home from the Russian front after a fierce battle has taken one of his arms and badly burnt his face. The Austrian village where he was born is unrecognisable from the place he left, governed by Poland and now occupied by the SS. Five years have past since Paul Brandt made an unfortunate choice as a college student, after taking part in a political stand at university, either join the army or serve time in prison. Little did he know that war was just round the corner when he took the first option. There was no way now, with just one arm, that he could return to the front line but not all enemies wear a different uniform and now his village lives in fear of the unpredictable and brutal SS Officers. The Retreat sounds a perfect place to get away from harsh everyday working conditions, a place of luxury and access to the best cuisine and women. There is just a couple of real problems here. The regular residents of The Retreat are the SS Officers that run the Concentration Camp only a stones throw away from the village that is struggling with surviving the harsh winter of 1944 and the women are some of the prisoners that have survived by luck more than need. They can be replaced anytime, no interview required or wage. Paul Brandt glances a familiar face of a woman in there, one from his past 5 years ago and manages to get a supervisors job, to the disgust of his family. But he has to figure a way out to protect her. This is an epic story of the reality of the ordinary German soldier, but that would be a lie. Others may see him as ordinary but he is far from it. The story takes a dramatic change as the Russian army make advances towards the village. The SS need to bury the evidence of their deeds. Just the name SS Officers puts fear into me and William Ryan just enforced it further. This is such a very emotional book, heart breaking in every possible way. William Ryan, by writing about the views of a German Soldier, opens up a new dimension with this story. Not one about the people in the concentration camps but of the village and how the SS Officers behave off duty. I forgot who was on who’s side everyone were just people. Some tyrants and others victims. So very touching and haunting. It left me with a real feeling of helplessness and totally stunned. A very memorable book, highly recommended. William Ryan is an Irish writer, living in London. William’s first novel, The Holy Thief, was shortlisted for a Crime Writer’s Association New Blood Dagger, a Barry Award, The Kerry Group Irish Fiction Award and The Theakstons Old Peculier Crime Novel of the Year. His second novel, The Bloody Meadow was shortlisted for the Ireland AM Crime Novel of the Year and his third, The Twelfth Department, was also shortlisted for the Ireland AM Crime Novel of the Year as well as the CWA’s Historical Fiction Dagger. 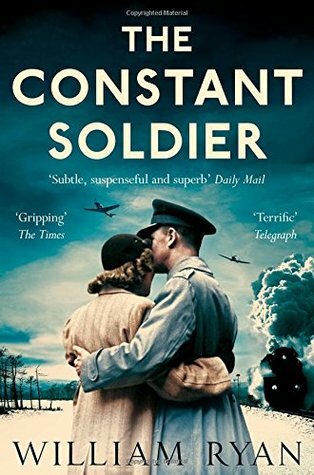 His latest novel, The Constant Soldier, was described as “a modern classic by a master storyteller” in The Lancashire Evening Post and has been shortlisted for the HWA Gold Crown and longlisted for the CWA’s Steel Dagger. Visit http://www.william-ryan.com for more information. I’m so glad this book touched you too. I loved it. I have a copy of this and I really feel I need to read it after reading your review! Great post!